What special features besides the obvious long range does a plane have to have to fly to and land in Antarctica? I know not just any plane can make the trip, but I couldn't find many relevant regulations or certification requirements. It seems like the C-17 and LC-130 are some of the most popular for these flights, based on the "US Antarctic Program Inter-agency Air Operations Manual" and this site. The manual does list other aircraft that can use Pegasus White Ice Runway: "C-5, KC-135, C-17, C-130, LC-130, P-3, A-319, and smaller aircraft". I also know the Basler Turbo BT-67, DeHavilland DHC-6 "Twin Otter" aircraft, and C-141 are traditional polar operations planes. In VOLUME 3 GENERAL TECHNICAL ADMINISTRATION, CHAPTER 29 PROVING AND VALIDATION TESTS, 3-2438 CLASS II NAVIGATION AUTHORIZATIONS D.4) North Polar (OpSpec/MSpec B055) and Antarctic Airspace (OpSpec/MSpec B050). Applicants proposing to conduct terminal area operations within these areas must conduct validation flights. No requirement exists for validation flights for those applicants conducting overflights if previously authorized in OpSpec/MSpec B036 and B040. During validation for approval of overflights of these areas, test teams should include in-flight planning, contingencies, CNS requirements, “fuel freeze” procedures, cold weather altimetry, applicant’s reaction and passenger recovery plan, and emergency airfield procedures. Airplanes must have enough fuel to reach an off-continent alternate if they arrive and cannot land. I also remember reading somewhere that these aircraft had to have fuel temperature and/or manual fuel level indicators to help prevent fuel freeze. So what special features or parts does a plane need to make an antarctic trip besides long range? Why are c-130's and DHC-6's perfect for this kind of mission? Note: Obviously pilots also have to have very specific and special training for Antarctic missions, but I'm focusing on the planes themselves in this question. I'm not aware of any specific 'certification' for aircraft operating to/from Antarctica. The air operations to/from Antarctica varies greatly depending on the location of the airstrip and season. Long trans-ocean flights to and from well developed Antarctic airports. Medium-range flights to and from short substandard Antarctic runways with limited facilities. Long trans-ocean flights to and from expedient runways that are rough or soft. For flights of the first category, exemplified by Christchurch to McMurdo in springtime, any conventional trans-oceanic transports, civilian or military, should be satisfactory as long as they have adequate useful range, with the ability to reach an alternate or to return to the point of departure, arriving with standard IFR fuel reserves. For medium-range flights to and from short substandard Antarctic runways with limited facilities, the aircraft can be smaller, but it has to be capable of safe over-ocean journeys, with appropriate range and engine-out performance. For long trans-ocean flights to and from expedient runways that are rough or soft, the aircraft requires both long range and robust, high-flotation landing gear. General configuration: High wing; high engines; tee-tail or high tail; low belly; spacious flat-floor fuselage; large doors (tail ramp,side hatch, swing nose). Engines: Multi-engine; gas turbine (free turbine turboprop; turbojet or turbofan). Landing gear: Wide stance; short legs; low ACN/LCN; large tires; soft tires; multi-wheel, multi-unit assemblies; large wheel-well fair ings (for big wheels or ski retract). Speeds: Reasonable cruise speed; slow approach; low stall and landing speed. Robustness: Strong airframe, tolerant to vibrations; reliable engines and fuel system; rough-field landing gear; good hydraulics; instruments, avionics and electrical systems resistant to vibration. You can see where this is going. The aircraft used in Antarctica are varied, with anything from C-17 Globemaster IIIs to re-manufactured DC-3s in service, De Havilland Twin Otter being one of the most popular. You can see that most of the aircraft operating from there are high wing aircraft with excellent STOL capability. 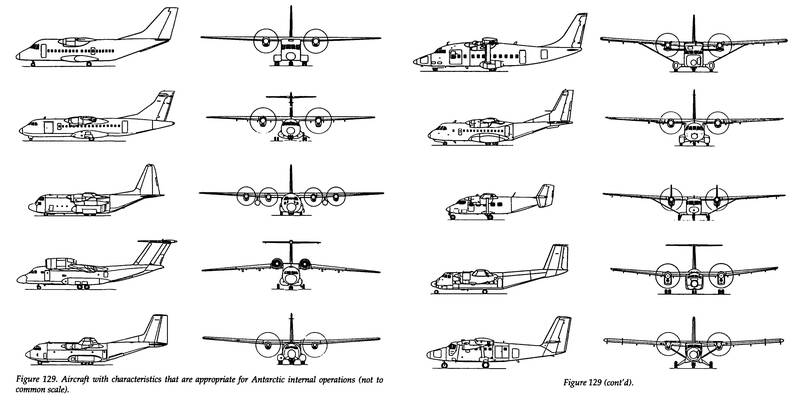 The report also lists some of the aircraft most suited for operations in Antarctica. Most of the aircraft look similar with high wing with wide, short landing gear and multi-engined. Quite a few of these are excellent STOL aircraft too. Obviously, they will be modified with the required navigation equipment and long range fuel tanks (for example, with long range fuel tanks, the range of Basler BT-67 is extended to ~4000 km). Operating in semi prepared fields require the aircraft to be equipped with skis- like the Lockheed Martin LC-130J. These aircraft have the provision for carrying out JATO operations. 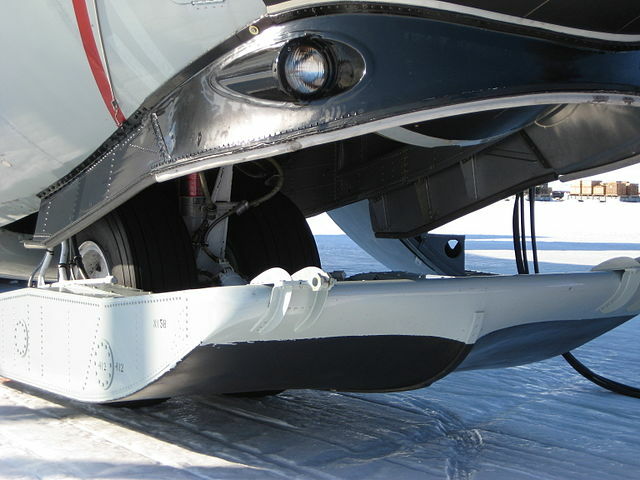 A number of smaller aircraft (like the Basler BT-67) are equipped with skis as well. 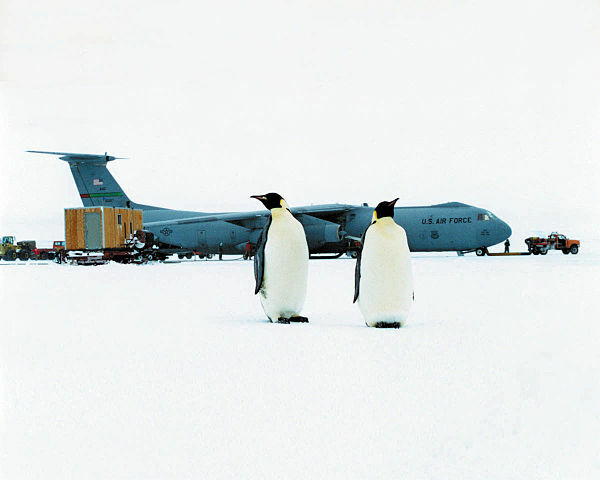 Aircraft operating in Antarctica should also consider the effect of air operations on the fragile and unique environment. The long range of aircraft come in handy as this limits the need for holding fuel reserves at the Antarctic airport, reducing infrastructure requirements and ecological impact. The A319CJ is designed with ultra-long range tanks, enabling the aircraft to return safely to its original port without the need to land and refuel. .... Skytraders limit the need for extensive ground support infrastructure by equipping its aircraft with specialist remote field functions such as its onboard stairs. This, in addition to the additional navigational aids (TACAN) fitted in the C-13Js. It should be noted that RNZAF still flies 757s to Antarctica. Not the answer you're looking for? Browse other questions tagged aircraft-design aircraft-certification icing polar or ask your own question. What are the FAA requirements for an aircraft to be IFR certified? Can you fly a plane in a wind tunnel? Are aircraft separately certified for CAT III ops for +2500 feet elevation? What's a Class F cargo compartment?